Creating a work schedule that balances the company’s interests and employees’ preferences is not an easy task. This e-learning program is designed to give you the knowledge and skills needed to create a well-balanced schedule. In this program you will learn how to calculate staff requirements, include shrinkage, and analyze cost/service tradeoffs. You will also gain an understanding of how to create custom work schedules based on previously calculated staffing requirements, to ensure the contact center reaches its service level goals. The program WFM - Scheduling is also included in the bundles Staffing Essentials and Call Center Staffing. Getting the right number of people in place at the right times to handle incoming calls; it’s every contact center manager’s dream. However, figuring out the right staffing mix to maximize service to customers, while minimizing cost, can sometimes be a daunting task. This course will teach you how to calculate the optimal number of call center staff to maximize service while minimizing cost to make the most of call center resources. 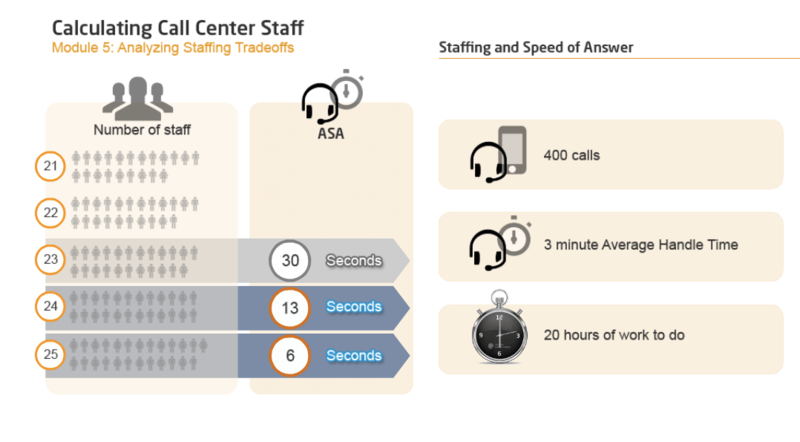 You will learn a step-by-step approach to call center staffing, including how to set service goals and how to use Erlang techniques to determine staff requirements. 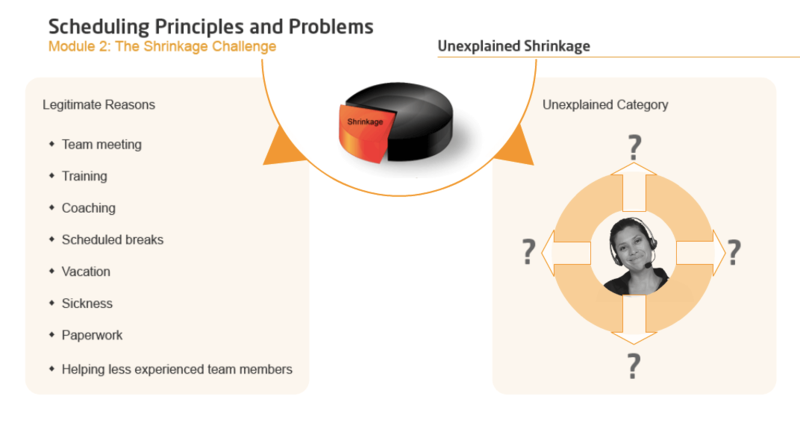 You will also become familiar with the most critical staffing/cost/service tradeoffs, such as the effect on service of plus/minus one person, the impact of large groups and economies of scale, and effects of staff occupancy. Identify factors in setting service level goals as well as factors contributing to speed of answer. Use Erlang calculations to pinpoint staffing needs. Identify service and cost tradeoffs and ways to improve service without adding staff. Describe the most common mistake call centers make in determining staff numbers. Identify ways to incorporate multi-media contacts into the staff planning process. Struggling to arrive at the delicate balance between efficient schedules and staff preferences? Don’t worry - you’re not alone. It’s the age-old problem that workforce planners and call center managers continue to wrestle with week in and week out. And just when you think you’ve got your schedules perfected, something changes. It could be a new skill in your skill-based scheduling, extended hours of operation, or the need to cover emails and web chats in addition to calls. In this course we’ll take a close look at scheduling challenges, outline all the necessary definitions and decisions associated with call center scheduling, and discuss scheduling best practices for today’s contact centers. You will learn traditional solutions as well as some innovative ones to help with your scheduling dilemma and match your contact center workforce to your incoming call workload. Describe schedule efficiency versus acceptability conflicts. Identify the ten most common scheduling problems call centers face today. Describe options that have worked for other call centers in solving scheduling problems. Identify long-term scheduling strategies and real-time reactions to meet service goals. Describe the latest WFM software capabilities for solving scheduling problems. We offer bulk discounts for orders containing 5 or more seats for a program or bundle. Check our pricing options for WFM - Scheduling below. If you apply for bulk pricing, please contact us to place your order. Master the ability to identify deviations from the forecast and/or schedule and making rapid adjustments effectively. The WFM - Scheduling program is designed by call center experts to provide a practical and engaging learning experience. Start today.